Dream Finders Homes, an award-winning home builder, joins Headwaters to bring homebuyers innovative designs and modern finishes. With a focus on quality and affordability, Dream Finders Homes prides itself on offering transparency through the entire homebuilding process. Come tour the Dream Finders Homes model home, opening September 2018, and see these gorgeous designs yourself. Dream Finders Homes offers six elegant floor plans at Headwaters from the mid $300,000s. Homes range in size from 2,754 to 3,750 square feet and feature three to five bedrooms and two to four bathrooms. With both one and two-story plans available and plenty of options for personalization, there’s sure to be a home that’s perfect for your family. Dream Finders Homes’ philosophy revolves around providing exceptional customer service to each and every homebuyer. Every step of the way, their specially trained team is ready to help guide you, from choosing the right floor plan to adding final design touches to even offering new home maintenance tips and guidelines. Personalization is key to making your home feel like its truly yours, and Dream Finders Homes empowers buyers with the flexibility to create their dream home. At Headwaters, you can find options for gourmet kitchens, fireplaces, extended lanais and additional storage space. 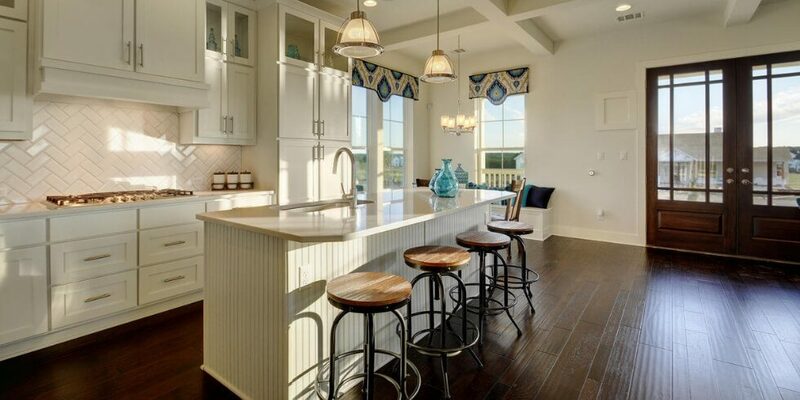 Homebuyers can also choose from a huge variety of finishes, including floor types, countertops and appliances. And with options for home automation, you could do everything from unlocking the door for guests, turning down the thermostat when running errands, or closing the garage behind your forgetful teen – all from your smartphone or tablet. Interested in learning more about the homes at Headwaters? Schedule a tour of our community or join the Interest List to receive news and updates.